Mellis to Eye Branch, Suffolk. The ornate Dukes Bridge (No 1115) at Yaxley looking towards Eye on 29th July 2014. The bridge was located 1Mile 40 chains from Mellis Junction and so named to commemorate the fact that the then Duke of Edinburgh travelled over the bridge on his way from Diss Railway Station in the mid eighteen sixties, at about the time of this lines opening. 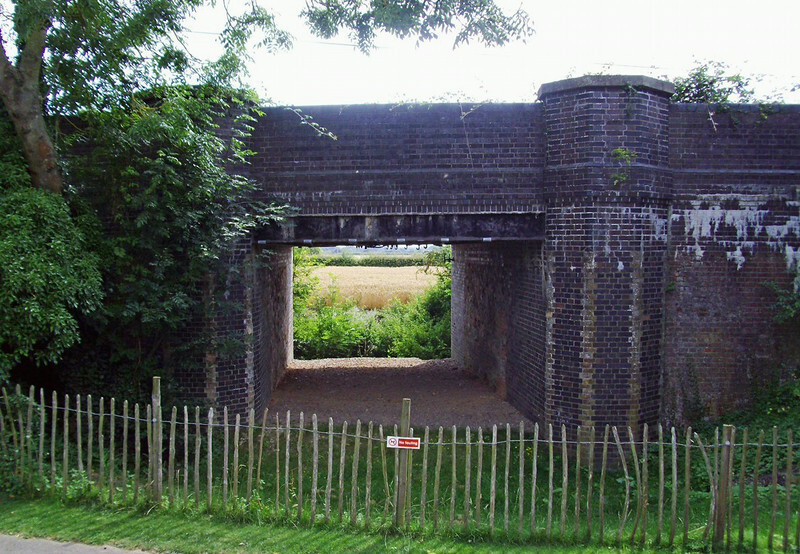 The bridge carries a minor road (Old Ipswich Road) over the line. This was the original route of the current A140 road which now bypasses Yaxley. To the right of the camera position was Yaxley Halt which had a sixty foot ground level platform. It opened on 20th December 1922, closing less than nine years later on 2nd February 1931. Waiting passengers often used the adjacent bridge for shelter during bad weather as the platform had no canopy. No trace of the station remains today and houses now occupy the track bed behind the camera. A photo of the station appears at the end of this album under Yaxley Halt.